It don’t mean a thing if it ain’t got that swing! Just one of the timeless swoons you’ll hear upon entering The Painted Cupcake, a modern 30’s & 40’s inspired cupcake bakery, nestled in the heart of Greens Hills. Duke Ellington, Jean Harlow and Dizzie Gillespie are just a few of the nostalgic tunes you’ll hear when entering the striped and floral accented shop. TPC is one of many cupcake bakeries in Nashville, but the difference between them and the rest of the competition is that they’ve got it down to a science. Simplistic beautiful aesthetics, moist cake full of flavor, and enough options to keep you coming back for more. 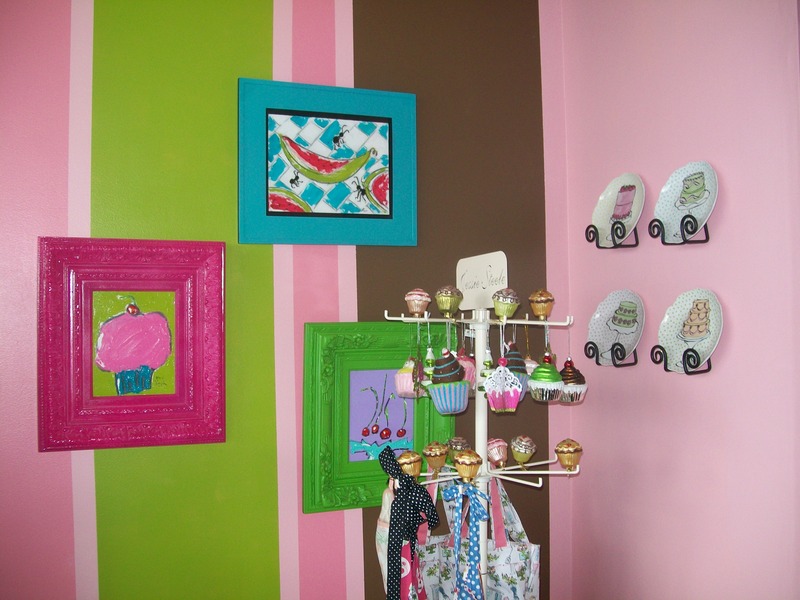 I sat down with the owner, self-proclaimed MacGuyver of cupcakes, Tracey Davenport. In a hidden event room embellished in feminine decor of black and white floral accents, a continuance of the signature black chandelier, candle abras, and kitschy art decor that makes for a kids dream environment in which to decorate their own cupcakes and t-shirts. Tracey embarked upon this journey in 2009 during the beginning of the economy tanking. Inspired by her Grandmother and years of cake decorating Davenport stumbled upon the empty space in the nostalgic downtown Arcade location, now relocated to the Green Hills location at 2014 Glen Echo Road. “My Grandmother was an amazing cook and conservationist. I still scrape the mixing bowl of anything I make today.” Davenport tells us. Which cupcake is your favorite? We ask. Tracey responds with a warm painted on smile . “The vanilla cupcake with the chocolate butter cream. ” Reminiscent of that Grandma used to make. The Painted Cupcake is bound to leap the idea of being a fad. Tracey is already embarking upon the changes that are to come with the quote on quote “trendy cupcake bakeries”. At TPC you can have your child’s birthday with your customized slide show and the ‘French Chef’, a suave character who entertains your party guest with magic and a fantastic French accent. “I have to give my husband credit”, David Davenport, who is the French Chef indeed. She tells us the dream wouldn’t be possible without his support and silent creative nature. He’s the behind the scenes man who makes it happen from plumbing to French imitations. We asked Tracey, what would you be doing if you hadn’t opened TPC? “Well, I am a full-time financial advisor, but I ‘d still be baking in the form of a cupcakery, art-gallery, and floral design shop all in one.” Well, it might sound like quite the undertaking but TPC already encompasses all three components. Their floral decor-ed cupcakes with sugar and hand-piped worked are some popular sellers. And let us not forget the whimsical pieces of art on the walls created by Tracey herself. You don’t have to tell me more than once to bake cupcakes!…YUM! My wife and I enjoyed the ‘Ike Johnson’ Red Velvet and Strawberry Fields. We’ve tried many a cupcake and not many are moist, with the perfect amount of icing. Let us also recommend the ‘The Bugsy’ Carrot Cake & Death by Chocolate. The smell of icing and fresh-baked cupcakes drove me crazy but it was a fascinating hour spent Tracey. Though it seems another bakery pops quite frequently. The Local Forkful is definitely endorsing this jewel to fulfill the need s of your sweet tooth. The Painted Cupcake can bring your cake dreams into reality. Bring in your Wedding Cake, Birthday Cake or Customized Cupcake Creation and Tracey and her devoted staff can make it come to life. Don’t bother with the over-piled Crisco cupcakes from across the street. TPC is the real thing and we at the Local Forkful believe their here to stay. Well, you heard what we had to say. Push the treadmill to the dumpster and head down for some cupcakes! Tracey and her staff are waiting. Now I want to try the Painted Cupcake. Charles, it was so good to meet you at Roast today. Hope to see you either at one of your working places or around food again soon. Thanks! It was a great experience and nice to finally meet everyone. Previous PostPlus de café et du chocolat s’il vous plaît? Next PostReal Men Eat Quiche!….True Story.